Reply due to unknown address is occurring frequently. In order to deliver more accurately, please fill in your exact address again in the comment field of the address page. Thank you for your cooperation. We will ship within 7 days from payment usually, but due to the small number of people in charge, product shipping might be delayed (take more than 7 days). In addition, it may take up to one month from shipment to arrival depending on the delivery country. We kindly ask for your understanding. ・You have 2weeks to return an order after receiving it. 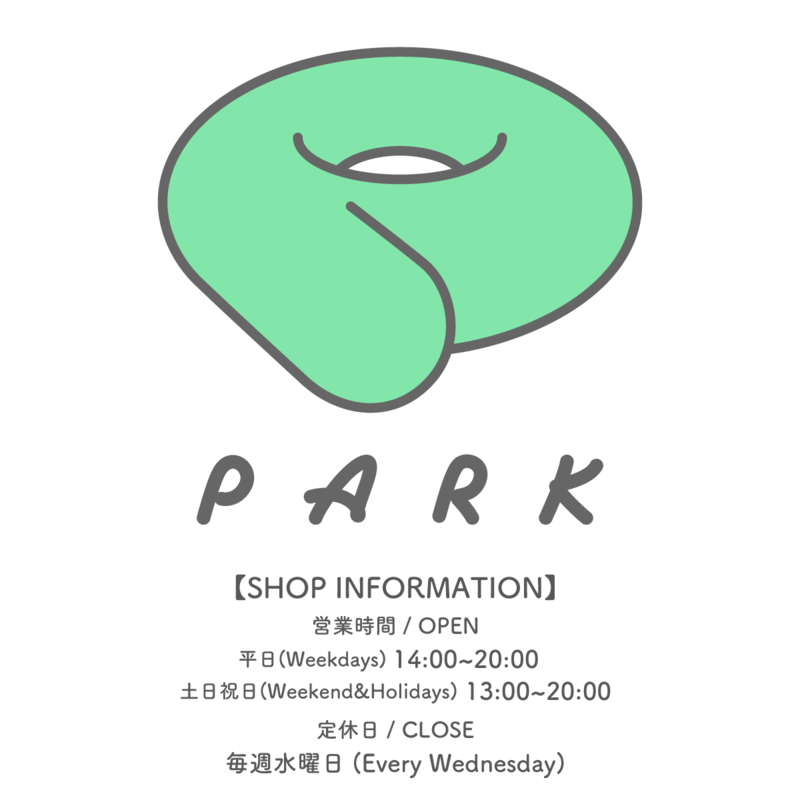 If the product you received is not what you expected, please contact us at info@park-harajuku.com before returning the item. Unless otherwise agreed upon, you must cover the cost of the return. 1. If you wish to make a return, send us an e-mail containing your name, address, e-mail address, the order number and which items you would like to return. 2. Ship the items for return within a week of the date of the notification. 3. You are responsible for any damage to the goods during the return shipment. It is highly recommended that you send the products well packaged, in good condition and in their original packaging. 4. Provide a tracking number for the return shipment if possible. 5. If a returned item is shipped internationally, mark as "RETURNED GOODS" to avoid any Customs charges. We are not responsible for any charges imposed on packages returned by Customs. 6. the refund will be processed through the same payment method you used to make your original purchase. 7. If the product or packaging is used or damaged, we reserve the right to deduct any depreciation in value when refunding the product. We will not do tax evasion. On the shipping voucher, we describe the exact purchase price. In general, there are no customs duties on small amounts of imports, but customs duties may occur depending on the purchase price, tax law and customs correspondence of your country. In that case it is necessary to pay customs duty by the purchaser.